After participating in a 3-week summer course aimed at helping refugees in Lebanon, students in the Arvind and Chandan Nandlal Kilachand Honors College shared their experiences and discussed the results of their work at a presentation Thursday. Muhammad Zaman, a professor of biomedical engineering, started the course with his colleagues at the American University of Beirut, intending to expose students to complex global issues. During the summer course, which lasted from June 30–July 20, students discussed the context of the refugee crisis, visited refugee settlements with the help of a local nongovernmental organization and translators and engaged in hands-on work to develop projects to aid refugees, Kilachand Director Carrie Preston wrote in an email. With about 68.5 million people forcibly displaced across the globe by the end of 2017, Preston wrote that the refugee crisis is one of the biggest challenges facing the world right now. During the presentation in Kilachand Hall, attended by about 100 students, two different teams spoke about projects they had created in Lebanon. The first was a water quality project that focused on getting clean, filtered water to the refugees at the camp. It was presented by Ashray Mohan, a senior in the College of Engineering, and Helen Lindsay, a recent BU graduate who joined the group in Lebanon as a teaching assistant for the course. This was followed by a presentation called, “What Do Kids Have To Look Forward To?” by Anna Bottrell, a student in the College of Arts and Sciences, Misty Ouyang, a junior in the Sargent College of Health and Rehabilitation Sciences, CAS junior Jessica Thai and CAS junior Sheila Phillips. The speakers discussed a project they had undertaken to educate refugee children, who they said face a lack of educational options. The students chosen for the trip intentionally came from different academic backgrounds, Zaman said, to ensure a diverse set of solutions to the problems being faced. Students in attendance said they found the discussion to be illuminating and informative. Tanapat Bhakyapaibul, a graduate ENG student, said that it is important to be learning about the Syrian refugee crisis right now. “And to get to hear from people who have actually been to Lebanon and have experience with [refugee] camps is great in terms of informing people who haven’t been necessarily informed or aware,” Bhakyapaibul said. 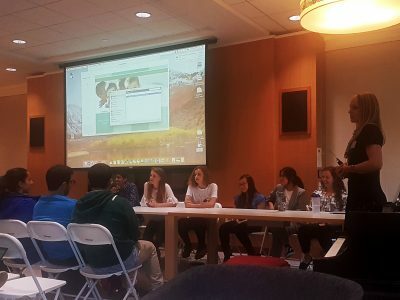 The evening closed with a panel where participating students answered questions regarding technology, sustainability, funding, language and cultural barriers, and safety. Bottrell talked about how helpful the experience was and how impactful hands-on learning could be. “There is nothing compared to being on the ground there and understanding who these people are and having faces to go with these big concepts that you hear about,” she said. While the projects are encouraging, Preston wrote, they require additional work before they can aid refugees. Because of this, she wrote, students likely got more out of the experience in the short-term than the refugees involved did. While the course was only three weeks long, Mohan said its effects on students will persist long beyond that time frame. The course will take place again from Jan. 2–19, according to Preston. The college is currently working to create a similar course in collaboration with Makerere University in Uganda.